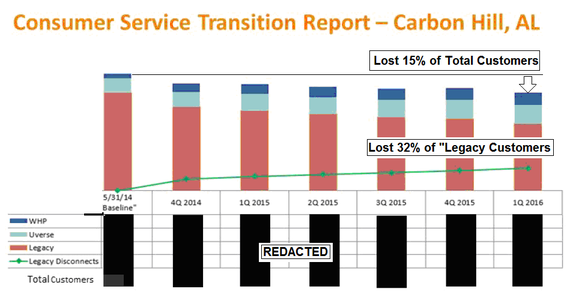 AT&T's IP Transition Trials Lost 32% of "Legacy" Customers, yet the Overhyped Con Continues. AT&T has been conducting 'IP Transition Trials' in Carbon Hill, Alabama and West Delray Beach, Florida, since May 2014. The goal was supposed to be the migration of existing regular, copper-based phone customers to new Internet Protocol (IP)-based advanced technology and communications networks, and many believe this includes upgrading the customers' premises to fiber-to-the-home services. NOTE: On July 14th, 2016, the FCC is meeting to make new rules about the IP Transition and rules governing the 'retirement of the copper' wires. The 'IP Transition' was a con job from the start--to push customers onto wireless. AT&T wireless replacement for a landline is called "Wireless Home Phone" -- and it can't do IP and it can't handle basic data applications, like alarm services. The numbers are terrible--AT&T lost 32% of the 'legacy telephone customers' and even with new "IP" customers, it lost approximately 15% of the entire original client base. The company is manipulating the stats for a "Happy Face" and the information has been redacted. This data should be public. AT&T spent millions on these trials for just two towns. We want to know how much it cost per acquisition of each new customer and what were the losses from losing 32% of its active telephone customers. Announcing the Death of the IP Transition Trials was Premature. I previously reported the death of the AT&T Internet Protocol (IP) Transition Trials that are going on as the AT&T IP Transition websites laid fallow with old data and tweets--and AT&T had even stopped filing required progress reports with the FCC. Instead, the Trials are back, as if reanimated like some 'Walking Dead Zombie' take off. AT&T filed a letter with the FCC supplying the reports for 4th Quarter 2015 and 1st Quarter 2016 on July 1st, 2016. The IP Transition for the IP delivery of voice, video and data services is not about technology advancement as told by AT&T--it's been a plan to remove regulations to have to provide any service, especially wired telephone service, even though AT&T is the state-based utility in its current 21 states service area. More importantly, the plan has always also been about migrating customers off the wires onto their wireless--but, with the caveat that the company hides the remaining wires known as 'special access' lines or as the FCC renamed them 'Broadband Data Services' (BDS), that will be used for wireless and the upcoming small cell "DAS" deployments. The reason for this reawakening is that the FCC is putting out a new IP Transition Order, expected at the FCC meeting on July 14th, 2016, and the scuttlebutt is that it will allow the incumbent companies, AT&T, Verizon and CenturyLink, to just shut off customers -- with minimum notice and the companies have already filed to make this happen. But this has all been a con... a deceptive play, not about technology advances; it's been about removing regulations and controlling public policies in the corporate interest and not the public interest. And, there are some who say that this is about migrating the copper-based customers to fiber optics. As we noted, Verizon has stopped most fiber optic-to-the-home deployments years ago, (except where there are contractual requirements). Their latest announcement to do the City of Boston appears to be no more than a ruse to use the fiber to do wireless 'DAS'--'fiber-to-the-antenna'. And there's a chorus of doubts about AT&T's current Gigapower and fiber deployments. Unfortunately, this is not my first rodeo of talking about these transitions and subplots; see the Harvard Nieman Watchdog piece from February 2010 and the 2016 stories for Huffington Post. 1) The AT&T IP Transition Was a Con Job from the Start-- to Push Customers onto Wireless, Their Wireless. And in this case, there were 4% of the customers that the company would not reach at all; "TBD"-- to be determined. NOTE: As we pointed out, AT&T had committed to having 100% of their territories upgraded to broadband services, albeit slow, in 22 states, including Alabama, as part of the AT&T-BellSouth merger by 2007. This "4%" proves that the company never fulfilled 100% -- either with a wire or even wireless, much less with IP. The FCC denied our call for an investigation. Unfortunately, this wasn't simply a 'hole' in one small rural town but has happened throughout the AT&T service territories. 2)	"Wireless Home Phone" Can't Do IP and Doesn't Handle Basic Data Applications. AT&T's "Wireless Home Phone" (WHP) is not an IP service-based phone - and it can't do basic IP applications. WHP is actually related to the infamous Verizon "VoiceLink", the wireless replacement of a landline. Right after the Sandy Storm in 2012, Fire Island and other parts of New York and NJ were decimated and the telephone wires were destroyed. Even though Verizon had a commitment to rewire New York City with fiber optics - Fire Island wasn't on the list and Verizon attempted to push customers onto wireless, including VoiceLink. The businesses and residents revolted and the wires were then replaced with fiber optics. "For emergency calls, you may have to provide your location address to the 911 operator." And the product guide specifically states that the service can not do Dial-up Internet or interface with an IP/PBX phone system--not to mention, it is not 'compatible' and/or can not handle basics like alarm services, sending and receiving faxes and credit card information or medical monitoring. For emergency calls, you may have to provide your location address to the 911 operator. The Wireless Home Phone device has a battery in the event of a power outage with talk time of approximately 3 hours depending on environmental factors. However, a landline phone requiring separate electric power to operate (e.g., cordless phones) connected to a Wireless Home Phone device will not place or receive calls (including 911 calls) during a power outage. If you experience a power outage and your battery is fully depleted, it will be necessary to restart your device when power is restored by sliding the On/Off switch off and on. "The Wireless Home Phone device cannot be used to make 500, 700, 900, 976, 0+ collect, operator assisted, or dial-around calls (e.g. 1010-XXXX). How, exactly is this a 'transition' and advances in IP technology - and not a hatchet job on the customer? AT&T's IP Transition has been a very large and expensive flop. Legacy phone service customers left in droves--with 32% leaving--about a 1/3 of the phone customers. These were AT&T customers before the Trial and had a working service--these are known as 'legacy' customers. But if you just go through the charts given, AT&T lost a total of about 15% of the customers, which includes the 'gains' from their IP migration. This next chart is the actual scorecard according to AT&T, for Carbon Hill Alabama. This is from AT&T's recent filing that included the 4th Quarter 2015 and 1st Quarter 2016 reports. NOTE: As you can see, the basic numbers have been redacted: We used this chart and placed a grid over it, then counted the actual spaces to determine the changes. Since we are doing these stats without the actual AT&T numbers, these are estimates +/- about 1%-5%. Notice that the total size is getting shorter. The total number of customers dropped about 15%--that's the top line (we added). The red-brown are legacy customers, the light blue is "U-Verse", while the dark green is 'Wireless Home Phone". But it is the lighter green line at the bottom which shows that 32% of legacy customers left; this info is supplied by AT&T's filing. However, it is clear that AT&T's recent filing shows that the company has decided to present manipulated findings to cover over their tracks. 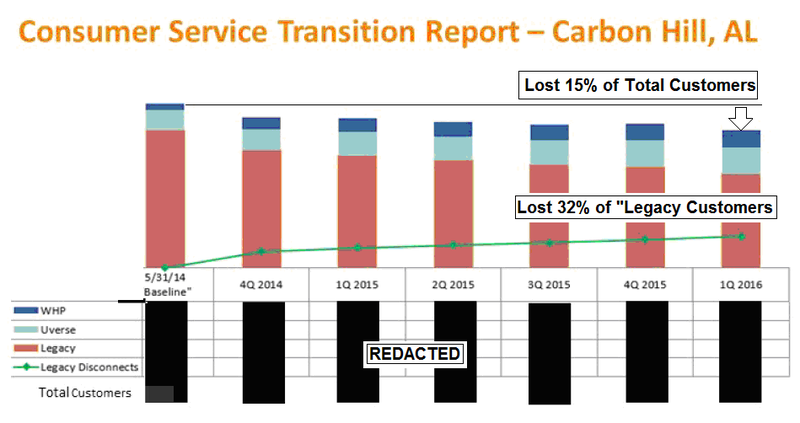 According to AT&T's letter, this chart shows that "Consumer IP'--the green and blue areas, increased 61% in Carbon Hill, and 50% in West Delray Beach. It is ironic that in both trials AT&T has lost an identical 32% of customers. And elsewhere, AT&T claims that since the start there was a 134% increase of Wireless Home Phone, WHP, and a 31% increase in U-Verse. The actual numbers have been redacted, but, like we did in previous analyses, we put these charts on a grid--and counted the boxes. Here's the problem. 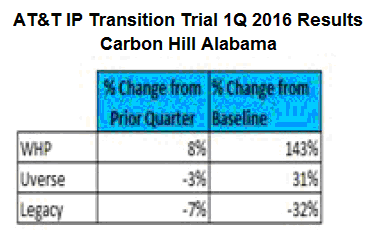 The numbers of WHP growth--134% since the start, and the overall 61% in Carbon Hill, AL, of the IP services, are white lies. The numbers presented never discuss that regular phone service was about 82% at the starting line, U-Verse had 13% and Wireless Home Phone had 5%. This means that legacy was about 4 times the size as the IP services. I.e., If there were 1000 customers, there would be 820 phone customers, only 130 U-Verse customers and 50 WHP customers. Bottom Line: The outcome, then, is that one service isn't IP and the other is 'copper' and not fiber--and customers didn't flock to these services. Though there was some growth in IP, the company lost about 15% of customers. And the growth of these services, in terms of the total customers shows U-Verse and WHP increases, were nominal. AT&T's stats make it sound like the Trial was a success and grew 61%. But when over 30% of your market leaves, you can't say it was 'successful'--especially when your new products don't cover the overall losses in customers. The AT&T IP Transition Trial letter to the FCC does not mention the overall number of customers or how the IP products fit into the total. And, AT&T does not mention the overall loss of customers, or that one of its primary products is not IP compatible with, say, an IP/PBX phone system. 5)	Throwing Money at the Problem Didn't Help. The Price of Acquisition. Simple Question: AT&T spent millions on these trials--How much did the acquisition of a customer cost? First, I've got to give the local AT&T IP Transition staff credit--they certainly tried to get customers to use the new services and blanketed the towns with marketing information--and it probably helped the local economy of the two towns. 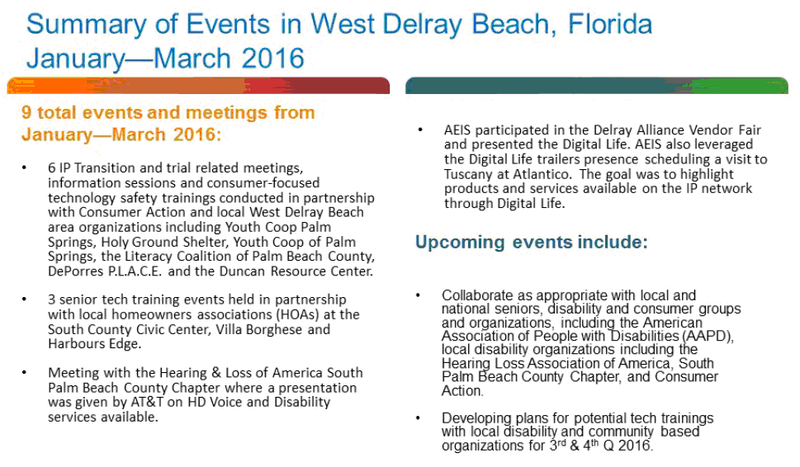 The new documents show that AT&T had 9 events in just West Delray Beach during the first quarter 2016. 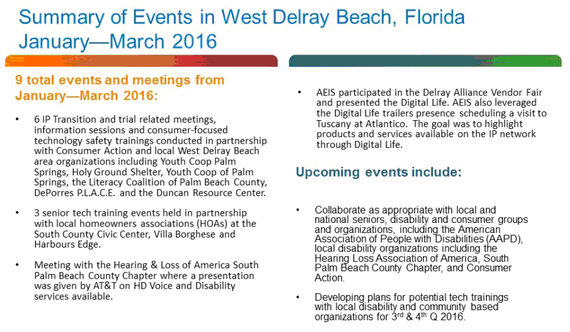 But there is still a hole in this story--AT&T didn't upgrade the web sites when they filed this new collection of exciting happenings in West Delray Beach, Florida. The old event page refers to their proposed plans for upgrading "our wireless infrastructure". And we checked in February 2016 and May 2016 before we declared the patient had expired in the previous article. The FCC's IP Transition Order could be influenced by AT&T's hype, or they could actually examine the data... we'll see what happens July 14th, 2016 when the FCC issues it latest report/Order. "Well, we're officially in phase 0, which is what they're calling it". This meeting with the FCC doesn't show up anywhere and this quote didn't make it into the Market Trials information supplied to the FCC on July 1st, 2016.